Take a seat outside the Grand Hotel and watch Mobile Bay go by. Event planners and grandmothers know: It’s the bumps in the road, the tiny flaws, which are remembered fondly years after a grand celebration takes place. And so it might be in Point Clear, when historians look back at Aug. 29, 2018 when the Grand Hotel officially became an Autograph Collection member of Marriott International Inc. There was a brass band that day, witnessed firsthand by your faithful Benchmarks correspondent. There was just the right amount of pomp and ceremony to honor a hotel dating back to 1847, but still remembering that listening to speeches outside in Alabama during August can give one the vapors. There were tours of the hotel’s most beloved features, including Bucky’s Lounge, the Grand Hall and the fireplace lobby. All of it was to mark the happy conclusion of a three-year, $32 million renovation to make the 405-room resort shine brightly once again. With transformed guest rooms, meeting spaces, updated restaurants, spas and grounds, the Grand Hotel now joins a family of 150 one-of-a-kind hotels that champion visionary hospitality. 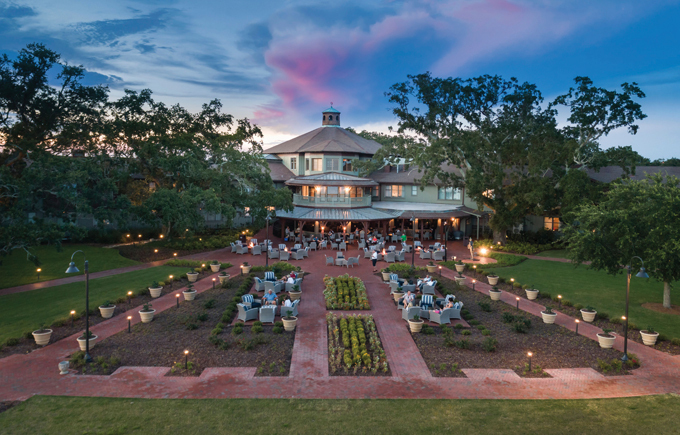 Owned by the Retirement Systems of Alabama, the Grand Hotel Golf Resort & Spa transformation was designed by Goodwyn Mills & Cawood and implemented by JESCO Construction, both Alabama companies. But back to that bumpy part of the road. Before the official rollout of the newest Autograph Collection hotel, a distinguished collection of Point Clear residents, fashion authorities and other assorted experts were invited to look over the property. That’s when the pearl clutching began, focusing on some plaid couches that had been placed around the iconic fireplace. “There was a controversy, but we listened and redid the furniture,” said RSA’s Bill Lang. “Everybody feels like they have ownership of the Grand Hotel, and we love that. So there are now a few plaid couches for sale on eBay,” he quipped. Other new touches also drew a little resistance but will stay. There’s artificial turf, for instance, along some of the Grand’s outside gathering points, where weddings and other celebrations occur. The artificial turf can be blown dry 30 minutes after it stops raining, as compared to regular grass that takes hours or days to dry. “With this stunning transformation nearly complete, the historic Grand Hotel enters its next chapter with its Autograph Collection distinction,” said Tony Davis, president of the RTJ Resort Collection. The resort includes two Robert Trent Jones Golf Trail courses, seven restaurants, spa, beaches and pools on 550 acres along Mobile Bay. While other aspects may be fresh and new, the afternoon cannon shot is still a daily fixture.